A Norwich City fan who is "absolutely convinced" of a Championship title win has had a tattoo to prove it. 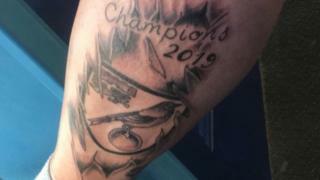 Shaun Hood's left leg is inked with the Canaries badge and "Champions 2019" - with eight games still to play. Daniel Farke's team are four points clear at the top of the table but fans on social media have both mocked and praised Mr Hood's confidence. "I think you have to have a bit of faith," he said. "I am absolutely convinced we will do it." He tweeted an image of the fresh tattoo on Wednesday, with the message "confidence is big #ncfc no pressure". "It is a bit of a laugh," he told BBC Radio Norfolk. "My friends think I am a bit of a nutter but I've had good comments too, it's not all negative. "It's been a good year for Norwich after things have been 'will we, won't we, where are we going to be?'." The 39-year-old from Wymondham said he hoped his next tattoo would be "Premier League Champions 2020". On Twitter, fans asked "have you actually had that done? ", while one called Mr Hood a "brave man", and another said "if we don't go up I'm blaming you lol". Last summer, several England fans marked the World Cup run with a trip to the tattoo parlour. Teddy Allen from Staffordshire had "Sir" Harry Kane's face and "World Cup Winners 2018" tattooed on his thigh and said he would keep it after England's defeat to Croatia in the semi-final.